Because we're responsible journalists we sometimes call an automaker when a rumor is so ridiculous we don't think it's true. 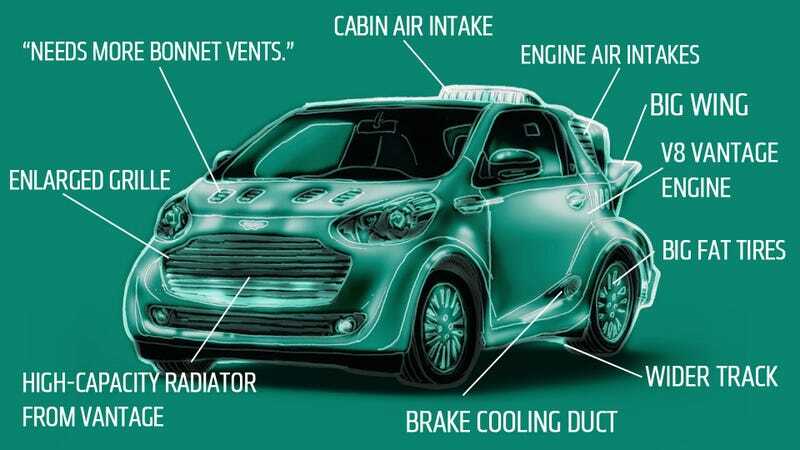 Thus when we heard of a V8-powered version of Aston Martin's diminutive Cygnet we called them. They said it wasn't true but Torchinsky did up a feasibility study and came up with a great drawing of one. Today, the rumor mill whipped up again with AutoCar reporting a "feasibility study" of a V12 swap was possible. This has been twisted into them actually building one. Aston Martin's Matthew Clarke says this isn't the case, adding "Looks like they were reheating a Jalopnik story to me." Not explicitly a denial that they haven't "thought" of it, but they say they haven't built anything. We have no reason to not believe them, but since it's such an incredible idea we're going to not believe them anyways.